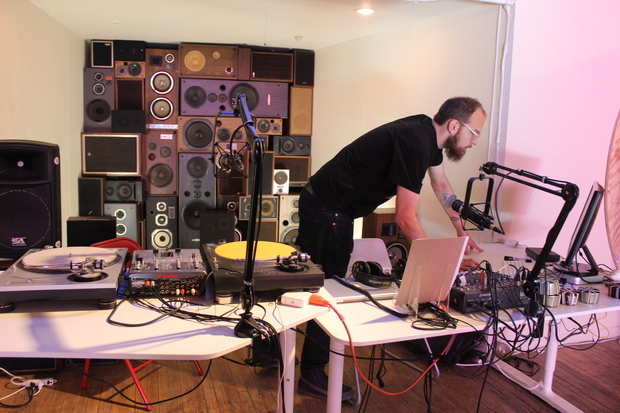 Logan Bay is the director of Lumpen Radio, which is based in Bridgeport's Co-Prosperity Sphere. BRIDGEPORT — The team behind a small radio station broadcasting from a neighborhood art gallery wants to restore the "magic moments" of turning the dial. "It won't be just like when you turn the dial and find your favorite song," said Leah Menzer, one of the co-founders of Lumpen Radio. "It'll be about the magic moments [of finding something new]." Based in the Co-Prosperity Sphere gallery in Bridgeport, Lumpen began streaming its "hyper-curated" programming over the Internet last month. It launched a Kickstarter campaign set to end June 4 to raise funds for equipment that would transmit the signal from the gallery. From that spot on 32nd and Morgan streets, Lumpen hopes to reach radios across Chicago with music, talk shows and other content that its founders say just can't be found in the city. "We're in a lucky spot where we are going to reach 1.7 million people," said Menzer, who worked to get its FM license approved at the federal level last year. Based on its Internet stream, the station won't have a predictable sound. You'll be just as likely to hear dance beats from Turkey as ambient sounds over police scanner chatter. "There are just so many weirdos who are DJs," said Logan Bay, who is Lumpen Radio's programming director. The station won't play only music, either. Lumpen, which takes its name from a term coined by Karl Marx, already streams events like Story Club and talk shows about Chicago's pro wrestling scene and tenant rights. There's a show in the works about magic as well. The station has a decidedly Bridgeport flavor at the moment. Most of its regular DJs live in or near the neighborhood. Ed Marszewski, the main force behind the station, also owns the gallery and Maria's Packaged Goods and Community Bar, where Lumpen records from every night between 10 p.m. to the bar's closing. There are plans to do the same from clubs and bars in other parts of the city as well. "We'll be in different neighborhoods," Bay said. "All of Chicago will be represented."